Motto: "Proletári všetkých krajín, spojte sa!" The Slovak Soviet Republic (Slovak: Slovenská republika rád, Hungarian: Szlovák Tanácsköztársaság, Ukrainian: Словацька Радянська Республіка, literally: "Slovak Republic of Councils") was a short-lived Communist state in southeast Slovakia in existence from 16 June 1919 to 7 July 1919. Its capital city was Prešov and was headed by Czech journalist Antonín Janoušek. In 1918, Czechoslovak troops began occupying northern Hungary in accordance with the territorial promises that the Triple Entente made to Czechoslovak politicians during World War I. 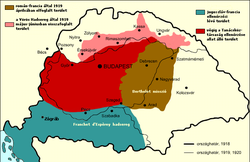 However, Upper Hungary (today mostly Slovakia) was occupied by Hungarian troops from the Hungarian Soviet Republic, who helped create the Slovak Soviet Republic. Following a brief war between Hungary, Czechoslovakia and Romania, the Slovak Soviet Republic fell and later the territory was incorporated into Czechoslovakia. This article about Slovak history is a stub. You can help Wikipedia by expanding it.